Croquet is OK! and lots of fun. OPEN DAY - Sunday 12th May from 10am. Seen it being played in Cassiobury Park (near the Cha Café)? Why not find out more about this fascinating game? Watford (Cassiobury) Croquet Club are running an Open Day on Sunday 12th May to introduce croquet to Watford and surrounding areas. Join us to have a try, and enjoy a cup of tea/coffee and a biscuit. All free, and no advance booking required - just come and have some fun in the fresh air of Watford's Cassiobury Park. 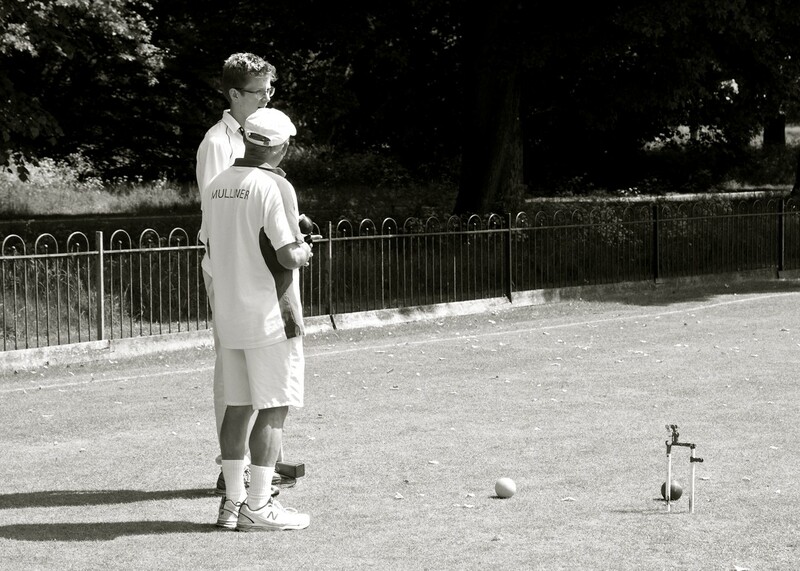 Croquet is playable by all ages, and from absolute beginner to World Championship* level. All equipment will be provided and no special clothing is needed, but please wear flat soled shoes or trainers to avoid damage to the lawns. If you are interested and would like more information please contact us. Or just turn up on the day.